The town of Bullingbrook has had relative peace for several months. There have been no bandits, outlaws, or Indians. When Hotspur, the son of an influential townsperson, takes the law into his own hands, Bullingbrook’s sickly mayor realizes that something must be done. Soon Mayor Henry Forth is facing a band of outlaws the likes of which no Western town has ever seen. With its sheriff and deputies away hunting bandits, Bullingbrook falls into crime and indulgence. Mayor Forth tries to reconcile with his estranged son, Hal, before he and his town succumb to two very different illnesses. Exactly six months ago Billy Wolfgang came to me with a rough draft for an adaptation of the two parts of Henry IV. The idea had been to transform the language, costumes and characters until we ended up with a show set in the Wild West full of gun slinging cowboys, saloon music and Can-Can dancers. I have a special place in my heart for westerns (having watched Tombstone more times than I can count) and I knew I just HAD to be a part of this production. Billy asked me to work with him on the script and to direct the show when it was finally ready. I had directed small pieces in college but this was my first full length show. I was nervous but excited to try out all of the things that I had learned from my theatre education at Millersville University. 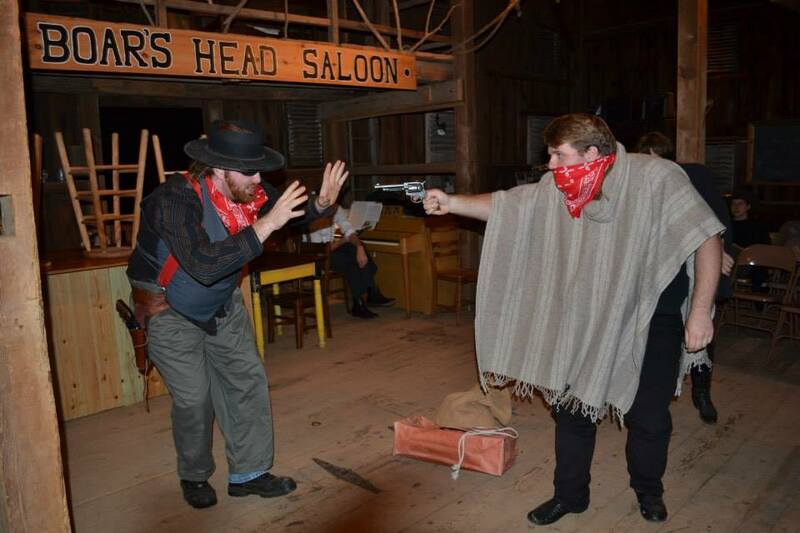 Fast forward 3 months; our script was finished, our actors cast and we began the journey towards transforming our beloved Shakespearean barn into a saloon, hoping to immerse our audience in the feel of the town. No matter what you may be thinking, an actor’s job is not easy. On top of memorizing lines and discovering their characters, many actors were also taught fight choreography and dance choreography. I applaud them for soaking up all of this knowledge and being willing to learn something new each and every day. Although this show is full of laughter there are also some very dark moments. Many of the relationships between characters are strained and broken. The Wild West was a rough place and only the strong survived. I want you to pay close attention to the bonds that we have worked so hard to portray; those between family and friends. We all need to make choices in our lives and those choices are the ones who define us. Now finally, here we are….show time! Throughout this process we have all had good days and bad days but no matter what the barn has always been full of laughter. As much as I love Shakespeare, I believe this adaptation has allowed everyone to remember how much fun acting can be! It has allowed us to immerse ourselves in the games we played as children and to become a family. And my hope is that you, the audience, also feel a part of the OrangeMite family and leave this show with a renewed energy! This has been a long process, full of obstacles, but I have learned a lot and am better for it. I could not have done any of this by myself and I have many people that I would like to thank; my wonderful cast who have all taken on many roles and responsibilities to see that this show reaches its full potential, my stage manager Bethany (who I literally could not function without), Mary and Doug (for their support with costumes, scenery and logistics), Billy (for everything else! ), the OMS board, my marketing group, Millersville Costume Shop and all others who have donated props and costumes, my family (for holding down the fort while I’m at rehearsals) and Andrew (for listening to a play-by-play of rehearsals each night). I love you all and I hope that you are just as excited as I am to finally present…..Vengeance for Hotspur!